Many of these tests have been conducted upon guinea pigs and rabbits and often the responses to the tests have been quantitatively and qualitatively different than in humans. 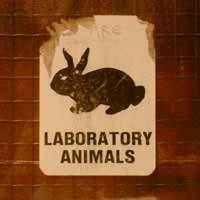 For example, in the Draize eye test, chemicals are dropped into the eyes of immobilised albino rabbits. Although it has been in use for over four decades, the predictions of the Draize test do not correlate well with human experience. This is shown by the fact that out of 281 cases of accidental splashing of household products into people's eyes that were compared with Draize rabbit eye test predictions for the same products, there were differences between human and rabbit responses of up to 250-fold. The Draize test exaggerates irritant effects, and accurately predicts human responses less than 50% of the time. The UK banned animal testing for cosmetics in 1998 and in November 2002 the European Union voted on a ban animal testing for cosmetics which will come into practice around 2009. Countries such as the USA and Japan are still a long way from ending animal testing for cosmetics. It is not always easy to distinguish which brands are cruelty-free and which are not because many companies do not clearly label their products, and some companies make ambiguous statements when referring to theirs. For example, a bottle of shampoo claiming "this product has not been tested on animals," may not be telling the full story. While the finished product may not have been tested on animals, some of the ingredient may have been. Another justifiable concern that you may have about your green personal care products is where they have been produced and that the producers and suppliers, particularly if they are in developing countries, have not been exploited. The Fairtrade Foundation has developed certification to ensure that disadvantaged producers in the developing world are protected. Producers that supply Fairtrade products are inspected and certified by the international certification body Fairtrade Labelling Organisations International (FLO). They receive a minimum price that covers the cost of sustainable production and also an extra premium that is invested in social or economic development projects. Fairtrade Labelling was created in the Netherlands in the late 1980s. Today the FLO co-ordinates Fairtrade Labelling in 20 counties including the UK. You will recognise certified products because they carry the FAIRTRADE mark. This is their consumer label which guarantees that disadvantaged producers in the developing world are getting a better deal. Although I find this very interesting and helping I would have liked to know what companies actually are ethical and fairtrade.